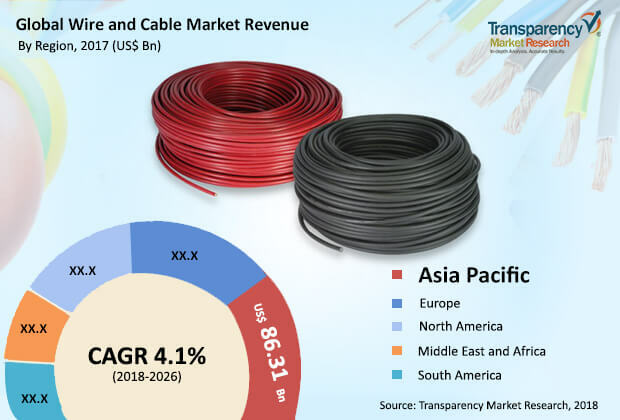 According to a new market report published by Transparency Market Research, the global wire and cable market is expected to reach US$ 235.9 Bn by 2026, expanding at a CAGR of 4.1% from 2018 to 2026. According to the report, the global market is expected to continue to be influenced by a range of macroeconomic and industry-specific factors. Asia Pacific is likely to continue to be at the forefront of global demand, with the market in the region expanding at the CAGR of 4.8% through 2026. The demand for wire and cables is directly reliant on the expansion of the industrial sector and infrastructure development in the power generation and transmission, telecommunication, and residential and commercial sectors. Rapid urbanization and rising global population have increased the demand in these areas, thereby offering multiple opportunities to the global wire and cable market. The global wire and cable market can be broadly segmented bybased on type, material, and application. byIn terms of type, the low voltage wire and cable segment is consistently expected to constitute a dominant market share between 2018 and 2026. Increasing urbanization, which is resulting in the expansion of power transmission & distribution networks and rise in residential & commercial buildings, is a major factor attributed to the segment’s high share. Moreover, rising demand for low-voltage wires in electrical installations of automobiles is another factor accounting for its dominance throughout the forecast period. However, out of all types, the optical fiber cable segment is expected to expand at a significant CAGR of 6.1% owing to its increasing applications for telecommunication systems, television transmission, and data networks. byBased on material, the copper segment held a prominent share of the market in 2017 and is further expected to lead the wire and cable market during the forecast period. Superior electrical conductivity together with high ductile and tensile strength makes copper a versatile material for wires and cables. Apart from high performance and durability, copper has ability to undergo stress with minimum signs of wear and tear and also requires less maintenance. Therefore, in spite of the metal’s high cost, the copper segment is expected to constitute 64.3% share of the overall wire and cable market in 2026. byIn terms of application, the residential & commercial buildings and power transmission & distribution segments cumulatively accounted for 64.3% market share in 2017. Rapid urbanization, especially in the developing countries of Asia Pacific and Middle East, is boosting demand for wires and cables in the residential & commercial buildings and power distribution sectors. Furthermore, increasing government initiatives across the world for the renewal of existing transmission and distribution networks is further driving the power transmission & distribution segment. Asia Pacific dominated the wire and cable market in 2017, with China constituting a majority share of its revenue. The dominance of the region in the market is attributed to its large population base, increasing industrialization and urbanization, development in transmission and distribution networks, increased renewable energy production, large automobile production, and supportive governmental initiatives for expansion or upgrade of existing infrastructure. In terms of country, China is expected to lead the wire and cable market in the region consistently throughout the forecast period. The country has a significant number of wire and cable manufacturers, and its production is more than double that of the next largest wire and cable producing country. Apart from China, countries including India, South Korea, and Japan are also expected to contribute significantly to the wire and cable market in Asia Pacific. The market in India is expected to expand at a rapid CAGR of 5.1% during the forecast period. North America and Europe collectively accounted for 34.2% market share in 2017. Their market share is expected to fall slightly in 2026 owing to the mature wire and cable market in the countries. The research study includes profiles of leading companies operating in the global wire and cable market. Market players have been profiled in terms of attributes such as company overview, financial overview, business strategies, and recent developments. Key players in the wire and cable market are Prysmian Group, Hengtong Optic-Electric Co Ltd., Furukawa Electric Co., Ltd., Sumitomo Electric Industries, Ltd., General Cable Corporation, Jiagnan Group, TPC Wire & Cable Corp, LS Cable & System Ltd, Polycab Wires Private Limited, Southwire Company, LLC, Hitachi Metals Ltd, Nexans S.A., Leoni AG, and Far East Cable Co., Ltd among others. Companies are focusing on expanding their business through strategic acquisitions and partnerships with several end-use industries.